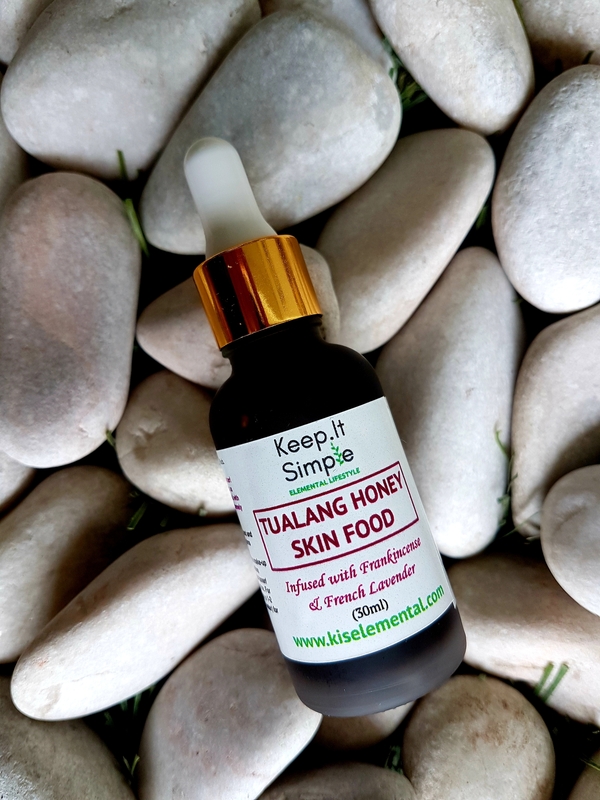 This multi-purpose skin food is made from raw, aged,and wild Tualang honey infused with Frankincense resin and French Lavender buds! It can be used as a gentle face and body cleanser, mask, toner and even a moisturizer! Honey, essentially, contains the essence of hundreds of wild flowers! It is full of life & vitality, just as healthy skin should be. While buzzing from blossom to blossom collecting nectar, bees transfer the pollen that collects on their wings and legs to other blossoms, pollinating them. Bees carry nectar back to their hive and infuse it with their own enzymes, then store it in perfectly symmetrical, wax honeycomb they’ve created from a gland within their bodies. Once the nectar is stored, the heat that generates from the movement and energy of the bees warms up the nectar, evaporating most of the water and resulting in a thick sugary, syrup we call honey. Honey gently removes dirt and impurities without stripping the skin of natural oils or causing skin pH imbalance. The natural antibacterial and probiotic properties of raw honey effectively reduce breakouts and prevent new acne. 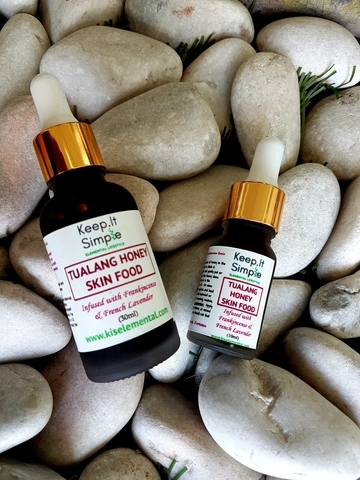 Raw honey contains natural enzymes which may refine the skins texture. Honey contains small amounts of gluconic acid and other alpha-hydroxy acids, which gently remove dead skin cells and brighten the complexion. Since it is so gentle and nurturing to the skin, it is ideal for very sensitive skin, rosacea, and eczema. It works well on all skin types. It balances oily skin and moisturizes dry skin. Honey is full of antioxidants, great for rejuvenating the skin and giving it a more youthful appearance. Honey is clarifying because it opens up pores making them easy to unclog. Raw honey contains beneficial bacteria (probiotics) that help to fight off bad pathogenic bacteria on your skin. It enhances your skin microbiome by adding more variety of the beneficial bacteria. 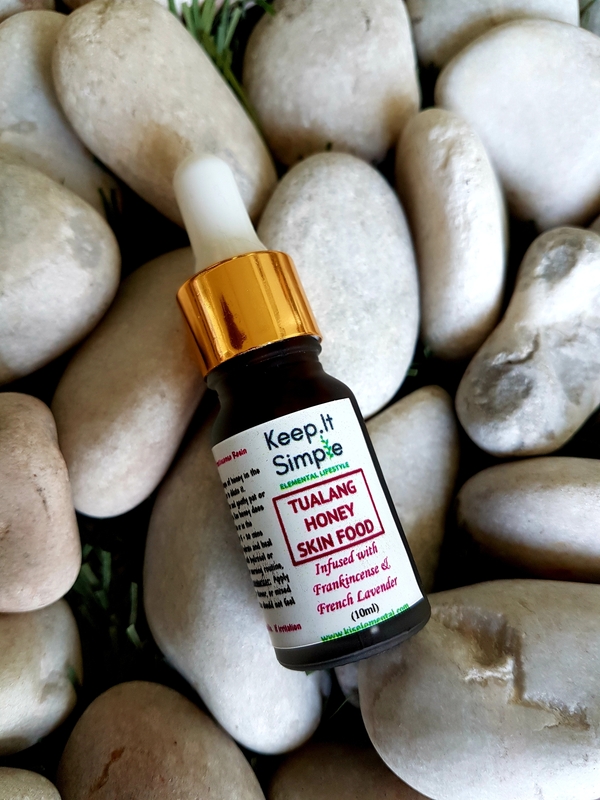 Tualang Honey is a wild rainforest honey from Malaysia. The Giant Honey Bees (Apis dorsata) hang their honey combs from the branches of the Tualang Tree (Koompassia excelsa) to collect pollen and nectar from the surrounding rainforest. This is real WILD HONEY (not from a bee farm), collected by workers risking their life climbing on very high Tualang trees that can grow up to 85 meters tall. It is therefore 100% organic honey straight from the rainforest - raw, unheated, unprocessed and no preservative added. The honey we use has been aged for a minimum of 2 years, naturally fermented thus enriching its natural properties even more! You will only need to use a few drops of this potent honey for each application. For ease of application, place a few drops of honey in the palms of your hand and spray some hydrosol or pure water to dilute it. Combine the mixture by gently rubbing your palms together and gently pat or massage into your skin. As a facial cleanser: 3 - 4 drops. Raw honey does not remove make-up, so is best used on make-up free skin or in the mornings. As a facial mask: 5 - 10 drops. Leave it on for 15 - 20 mins before rinsing off with cool water. Apply on lips as well to hydrate and heal chapped skin. As a face toner/humectant: 1 drop diluted with hydrosol or pure water. Can be used for morning or night routine. For morning routine, follow up with 1 - 2 drops of face oil. As a body moisturizer: Apply a 1-2 drops of honey (either on wet skin after shower, or mixed with hydrosol or pure water) for each body section. The skin should not feel sticky after. If it does, use less honey. Note:Reactions or allergies to honey are unlikely, but possible. Organic raw honey should be soothing to skin, so if you become red or irritated by using it, that may be a sign of an allergy, in which case honey should be avoided. But thankfully, raw honey is more often one of the few products that won’t create reactions in highly reactive skin. Disclaimer: We firmly believe that the basis of healthy skin has more to do with what we eat, think, feel and do! When we put in the effort to consciously eat healthy, live healthy, think healthy & feel healthy, our skin becomes effortlessly radiant and beautiful! Our skin is an amazingly complicated and complex organ, and together with its healthy & balanced microbiome, is independantly able to keep itself healthy and balanced in most circumstances. Thus, as long as we are doing our part in our health department, our externally applied skincare should be minimal, fresh and most importantly, minimize harm to and support our skin and its microbiome as much as possible. 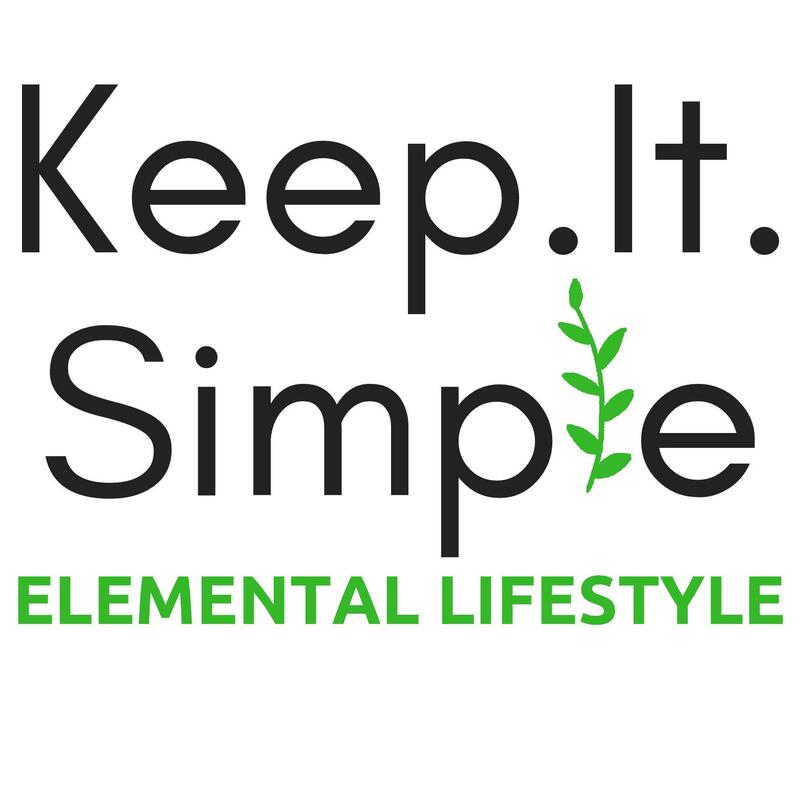 At K.I.S Elemental, we are proud to say that this forms the basis of all our skincare products and formulations!